The Ministry of Public Works released their quarterly figures this month showing details of where foreign nationals are buying property in Spain. Still suffering from the aftermath of the bursting construction bubble, six years on, the percentage of total homes bought in Spain during the last quarter of 2013 by foreign nationals declined slightly from 2012 to 11% (which could be explained by the 2012 changes to the primary home rebate prompting people to buy quickly). Where are they buying property? This equates to 14,800 new property sales by non-spanish residents in the last quarter of 2013, throughout Spain. Furthermore, foreign nationals (residing in Spain) spend an average of €153,000 per home (rising to €260,000 in the Balearic Islands) 12% more than the natives who on average spend €135,000. Unsurprisingly the majority are coastal properties with Alicante, Malaga and Barcelona leading the sales (See table) where a good quality of life and reasonably priced property, alongside optimism for growth and returns on investment have made them prime locations. Top nationalities who have invested in property in Spain, particularly on the islands include primarily German, British, Russian and Norwegian buyers. French nationals tend to prefer the north of Spain, and the rest of mainland Spain still manages to attract big investors from round the world, flocking to buy a second home here. Latin American and Middle Eastern nationals are keen to find a spanish property, mainly in Barcelona or Madrid, to use as a European base, and the average price goes above €500,000 for a second home (as opposed to a rentable investment property). European buyers may buy a second home that will eventually serve as their primary property when they reach retirement age, and thus spend on average €300,000. Russian buyers spend the most however and aren’t afraid to go above €500,000 euros. Chinese buyers are too increasing in numbers, taking advantage of the residency permits allowing free movement around Europe and business opportunities on the continent. 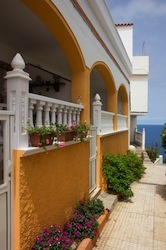 Despite the optimistic insight, the spanish property process could still be simplified further. It is extremely beneficial to have independent advice and help through the property buying process (ie. not linked to real estate agent who may have their own interests at heart) and take you through the legal checks and agreements involved outlined in the property law section. Here at Spainwide we’d be very happy to help you secure your future home in Spain with minimal trouble and utmost efficiency!